Betrayed by her evil sister Ravenna (Charlize Theron), heartbroken Freya (Emily Blunt) retreats to a northern kingdom to raise an army of huntsmen as her protectors. Gifted with the ability to freeze her enemies in ice, Freya teaches her young soldiers to never fall in love. When Eric (Chris Hemsworth) and fellow warrior Sara defy this rule, the angry queen does whatever she can to stop them. As a war between the siblings escalates, Eric and Sara unite with Freya to end Ravenna’s wicked reign. 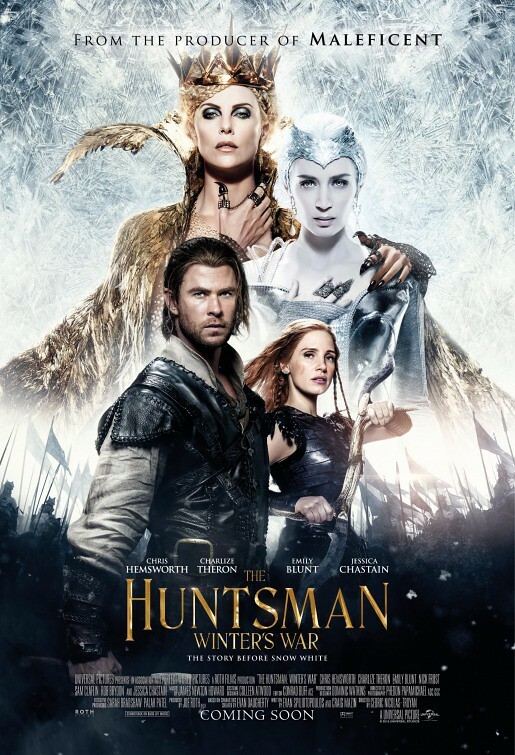 The Huntsman: Winter’s War is the prequel and sequel of Snow White and the Huntsman (2012). In a matter of the story, I like this film way better than the previous film, of course. The story is so much better. It doesn’t relate to the actresses who played in the film—or perhaps it actually does. Kristen Stewart who used to play Snow White is no longer in this film, despite being the main character herself. However, the addition of Emily Blunt and Jessica Chastain is awesome since I love them more, anyway. It’s no secret that Emily Blunt is my favourite actress, so I am super excited that she joined the cast. What’s more exciting is Colin Morgan also joined the cast as well. After Merlin (2008-2012), I absolutely want to see him more, even though I am already excited enough with Sam Claflin came back as Prince William. If you asked me why, well the answer is pretty obvious. He is one of my favourite actors too! Anyway, anyway, the story of The Huntsman: Winter’s War is absolutely better than Snow White and the Huntsman. This prequel/sequel told us about what happened before Snow White and what happened after Snow White defeated the Evil Queen, Ravenna. In addition to the Evil Queen, now we got the ice queen. 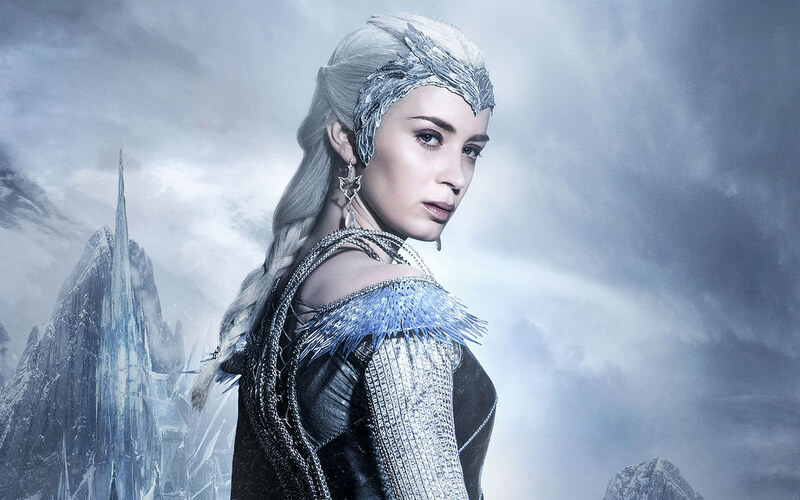 Surely Emily Blunt played a very great ice queen. I really like her. No, scratch that. I love her! At some point, she was compared to Elsa from Disney’s Frozen (2013), but I don’t think they are the same. Sure, they both are the ice queen. But they both are very different. I don’t think Freya is a villain. Yes, she is an ice queen and at one point she looks like a villain. Even so, she is one of my favourite villains after Loki, who is played also by one of my favourite actors, Tom Hiddleston in Marvel films. I really think Emily Blunt fits the role very much. She is beautiful and a great actress as well! Chris Hemsworth is back as the Huntsman. Although I am not a fan, I think he really does suit the role. After the mighty Thor, a Huntsman won’t hurt, right? Jessica Chastain is another addition to the film. I think she is a great actress after all. I kind of watched her films lately and she is truly remarkable. Her accent is convincing. Well, Hemsworth also did a good job in his Scottish accent. Well, I am not expert myself, but in my opinion, it’s pretty good. I mean, when you heard Chastain usual accent or when she played the role of Lady Lucille Sharpe in Crimson Peak (2015), she sounds so different. That is why I think she has done a great job. Playing a different accent in different roles in one time is not an easy job, but she pulled it off anyway. One of the most entertaining parts in The Huntsman: Winter’s War is perhaps the dwarves. Yes, Hemsworth also entertained us quite awhile but most of the times, it was the dwarves who made me laugh through the film. However, they are, of course, not the main entertainment. The main entertainment is still the story of the film. It’s different. I know it is already different even from Snow White and the Huntsman, but then again, the overall story of The Huntsman: Winter’s War is better. It is more interesting, I must say. As for the set of this film is very convincing and very great. I mean, the ice, the village, everything is astonishing. Personally, I want more of Freya. She’s just so good and interesting. Regardless being the villain, I am very interested in Freya. I understand why she did what she did. And in the end, she did the right thing anyway. Like Loki, she is actually good but people always misunderstood her. That’s why I like her—love her, actually—very much. She is a very interesting villain, not to mention very beautiful indeed. I seriously want to see her more. Nevertheless, the film is already good enough. I don’t know if I like the ending of The Huntsman: Winter’s War or not, but I think it’s still better than Snow White and the Huntsman. At least this film has clearer ending than before. Seriously, Snow White and the Huntsman really does have an unclear ending. Perhaps if Kristen Stewart was cast again, we’ll know what happened to Snow White and the Huntsman. I personally don’t really like Stewart’s acting. She’s a bit somehow looked emotionless. I can’t feel her emotions most of the time when she played a role. Whether in Snow White and the Huntsman or in Twilight Saga. Therefore, without Kristen Stewart in this film, I personally think it is more than okay. The Huntsman: Winter’s War is more than a satisfactory. Snow White was destined to be with his prince, not with the Huntsman. And that is why I like this film better. Not to mention the prince is Sam Claflin and I do want him to have a happy ending as well. The film is good and enjoyable, not to mention there also my favourite actors and actress in the film. This film is definitely better than its prequel/sequel, Snow White and the Huntsman. I give The Huntsman: Winter’s War 8 out of 10 stars.